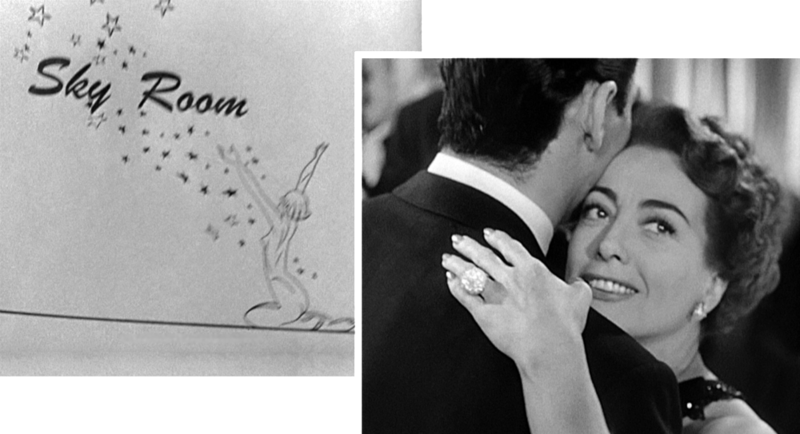 Myra suggests they meet at the Fairmont Hotel - we see them dancing there at the Sky Room. Then ... But in real life back then the Fairmont had the Venetian room and the Cirque Room but not a Sky Room. What's more, CitySleuth recognizes the window view behind her friends, personal lawyer Steve Kearney (Bruce Bennet, who lived to be 100 years old) and assistant Ann Taylor (Virginia Huston), as being the view from the Top O' The Mark at the Mark Hopkins Hotel, across California Street from the Fairmont (map). ... in the 1950s ... here's the same view, looking east to the Bay Bridge, captured by this vintage daytime photo taken from the Top O' The Mark. The window view above is the portion outlined in yellow. ... from another movie ... the same view appeared five years earlier in the 1947 movie Born To Kill. ... from yet another movie ... and it was seen six years later in the 1958 movie Vertigo. San Francisco did however offer several so-named Sky Rooms. The first one opened in 1938 on the 24th floor of the Hotel Empire (formerly the William Taylor Hotel), but closed down only 5 years later. In the postcard image of the hotel, below, you can see the oversize Sky Room windows glowing red. Since 1978 this grand 1930 structure at 100 McAllister Street (map) has belonged to the University of California's Hastings College of the Law. And check out this postcard extolling, with more than a little hyberbole, the virtues of the Hotel Empire Sky Room - a very swanky place indeed. Then there was the Sky Room at the Marines Memorial Club at 609 Sutter Street. In the 1947 photo below we see a more functional restaurant and bar but it too had panoramic views. And let's not forget Andy Wong's Chinese Sky Room on the southwest corner of Grant and Pine, offering visitors even more entertainment by way of a Chinese floor show. Getting back to the movie ... Myra and Lester next head over to the Chapeau Blanc. CitySleuth is not aware of this club - was there such a place in San Francisco? Let him know. Then ... Finally, in the wee morning hours after the long journey west and dancing through the night, Myra drives Lester to her palatial home in Cow Hollow. The view from Green Street looks north down Scott across the Marina district. ... and Now, other than the trees, an unchanged view. Then ... A sweeping U-turn brings her home - note the angle of the car on this very steep block. Opening the driver's door against gravity would have been a challenge for Myra but Lester plays the perfect gentleman - he leaps out and does the honors for her. ... and Now, today's view of the home at 2800 Scott Street on the corner of Green.